Origin and Habitat: The species is native to central-northern Madagascar. Habitat: It grows in the open coastal forests mainly on strongly eroded calcareous rocks, the fissures of which are filled with humus. It is mainly found on sunny or half-shaded places in deciduous dry forest together with Pachypodium rutenbergianum, Uncarina sakalava, Uncarina perrieri, Lomatophyllum sp., Commiphora sp., and Cyphostemma sp. 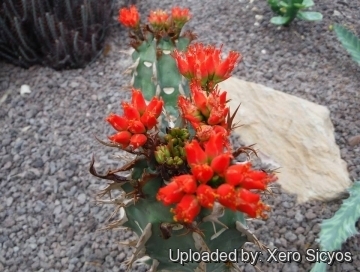 Description: Euphorbia viguieri is a very handsome plant with an angular, bright green stem with vertical, spiralling whitish thorns and vibrant red top-knots of floral parts. It is not a cactus, although it looks like one. 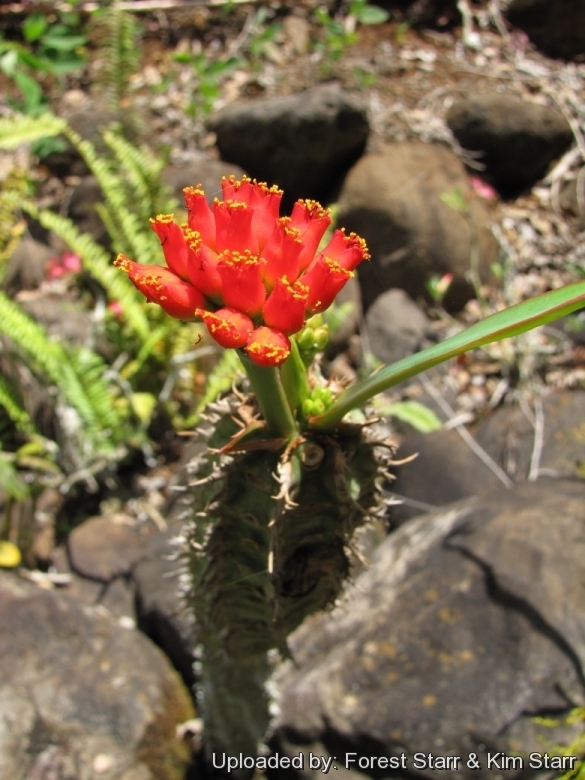 Habit: It is a very variable deciduous spiny succulent species, with a single stem, usually not ramified. Stems: Narrow at the base up to 80(-150) cm in height, with a diameter up to 3 cm, 5-6-angled and ridged bearing whitish triangular-elliptic leaf scars and rows of irregular spines along the ridges. Leaves: Simple, clustered towards the tips of branches on a thick and short stalk, emerald green, basally red with white prominent veins on the underside, 6-15 cm long and 3(-6) cm wide, oval, at the end with a little mucro. Tends to be deciduous in winters in cultivation. Thorns: Laciniate (flat at the base and subdivided towards the apex in several thinner thorns) on a thick tuberculate base, robust, 1.5-2 cm long, secondary thorns longer or shorter. Inflorescences (axillar cymes): At stem tip, subsessile or on a peduncle long up to about 10 cm. Flowers (cyathia): Erect surrounded by two brilliant red bracts (cyathofills). The cyathia can be unisexual, even on different plants, or bisexual. Fruit (capsule): Three-chambered, each one containing only one seed which, when ripe, is expelled and thrown far away. 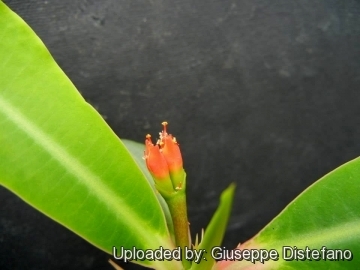 Euphorbia viguieri Denis: (var. viguieri) has pedunculate inflorescences and mostly unisexual cyathia. 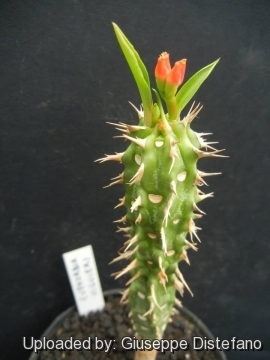 Euphorbia viguieri var. vilanandrensis Ursch & Leandri: has short inflorescences with green cyathophylls, and the quickly deciduous stipular spines. 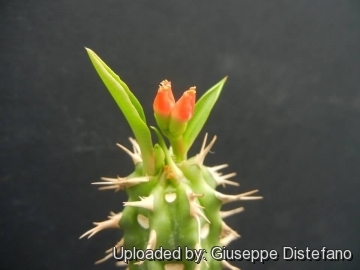 1) Forest & Kim Starr “Euphorbia viguieri (Euphorbia)”. Plants of Hawaii. <http://www.starrenvironmental.com>. Web. 27 Sep. 2014. 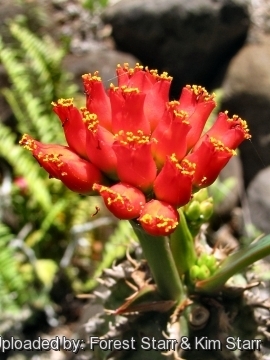 6) Rauh, W. “Succulent and Xerophytic plants of Madagascar.” Vol I. Strawberry Press, Mill Valley.1995. 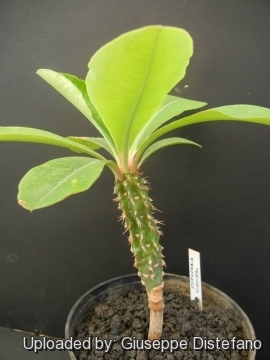 Cultivation and Propagation: Euphorbia viguieri is a very ornamental species, easy to grow and suited for any well drained soil on bright light. It can be cultivated in open air in tropical or subtropical climate zones, in full sun, or (preferably) in light shade, on perfectly draining calcareous soils. But young plant are happy growing indoors too. Growing rate: It is a slow grower. Exposure: These plants don't seem to love being blasted by the sun in the summer but prefer bright light, and will therefore not make demands on your prime growing space. However shade grown plants will tend to produce fewer, and etiolated growth (weak, gangly stems with unusually long internodes, and generally paler green coloration). The colour of this plant is much more marked if grown in full sun. Watering: It is relatively flexible in its watering requirements. It needs much water when it is growing. It can be watered regularly as long as the medium is open and well drained. As with any normal plant when watering, it is best to do so thoroughly, until a little water comes out through the drain holes. Allow the medium to dry out somewhat between waterings. Reduce watering during winter. Space plants apart to allow air movement between branches and leaves. This will help with evaporation of extra water droplets collected during watering. It is prone to rot in winters if watered much. Soil: The ideal potting-medium is one with good moisture-retaining capacity but open and well drained with a little lime gravel. Fertilization: Use fertilizer with low nitrogen and high phosphorus and potassium ratios. Feed during spring and withhold feeding during winter. Hardiness: Very tender, protect from frost . Temperature spring to autumn: nocturnal at least 18°C and diurnal up to 38°C. Wintering: nocturnal 12°C and diurnal 20°C or more. Warning: All the parts of the plant are considered as toxic. As with all other Euphorbias when a plant get damaged it exudes a thick white milky sap known as latex. This latex is poisonous and particularly dangerous for the eyes, skin and mucous membranes. So pay extreme attention not to get any in your eyes or mouth. Cultivated plants must be handled carefully.